During a spacious moment yesterday, I worked out that we’ve seen about 100 plays and shows since last writing this blog. Got to admit that the tally has been inflated by the Bush Theatre’s extraordinary ’66 Books’ – the 24-hour non-stop marathon of 66 plays, each a secular response to one of the 66 books of the King James bible. We snuck home to sleep for a few hours, but we were there for two-thirds of it and loved two-thirds of that. We saw 19 shows in Edinburgh over 3 days, dragging a hardy bunch of friends with us and delighting in the emotive mime of Translunar Paradise in particular. Saw a couple of things at the Almeida’s uneven Theatre Brothel back when the sun was shining, where the glorious Inua Ellams outshone everything else. In the past month we’ve seen Decade (good), Wittenburg (very good), Saved (painful), Top Girls (interesting). We were part of a small audience for the half-play, quarter-dance, quarter-interactive thing that was Quarantine’s Entitled at Sadlers Wells. For comedy, there was Stewart Lee and the perfection of the Pyjama Men – and yes, I also took a bunch of clients to see Priscilla Queen of the Desert. The costumes were inspiring. So, you’d have thought we’d have had more to say about all that. We got a bit distracted by endeavours elsewhere – building the wonderful theatre website StageScan.com (the other C), and embarking on occasional artistic efforts involving Burning Man costumes and house refurbishment (this C). But we are still here, still going out on school nights, still… oh, you know. Get on with it, C+C. OK, rebooting. Should I stay or should I go: that is the question. It doesn’t sound that bad. Resign, relax. Makes relaxing here or there a joke at best. No second chance in England. So, press on. And not to start some other, smaller contest fresh. I might in fact be somewhat bad at golf. Becomes a waste of time for them, and too for me. This line of thought’s abandoned. Soft ye now! 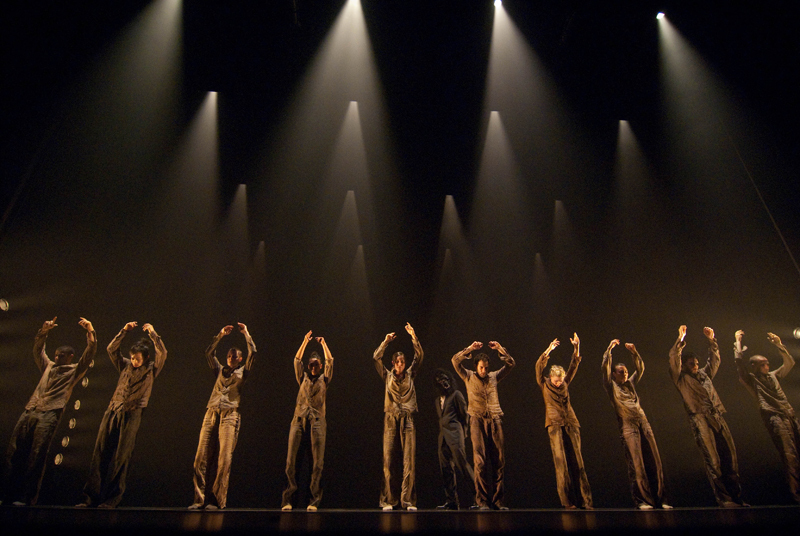 Hofesh Shechter is a rock star. I mean this kind of literally. A fierce drummer by background, he excels at yelling incoherent lyrics at a crowd standing hypnotized in adulation, like fans listening to a ballad at a rock concert. 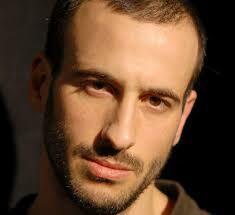 Hofesh Shechter is also one of the dance world’s hottest choreographers, and that’s partly because of the above. His work is as much about the music and the interplay between sound and form as it is about the dance alone. The music he creates is often raw and bombastic, the dance sinuously connected to the beat and throb. 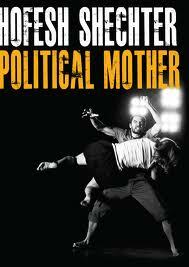 Correspondingly, he is proud that Political Mother was described as an ‘audio visual marvel’ when it premiered in 2010. Why all the noise in summer 2011 about a year-old show, then? Well, this version of Political Mother is billed as the ‘Choreographer’s Cut’, which signals that this version is even more Shechter than before. More dancers, more musicians, more more. It’s a spectacular sensory experience. The show opens with three layers of those musicians being revealed in turn, in mesh-covered performing booths at the back of the stage – like a high-concept Celebrity Squares (Hollywood Squares for US readers). First, Bach-heavy classical strings lay out what might have been a serene representation of the beauty of the human soul, except for the intense volume and an intimation of crackling feedback adding edge to the music. Suddenly, the strings are submerged by the startling appearance of half-a-dozen pounding drums and guitars occupying a much larger space above them. One of them is wearing a safety belt, to prevent his thrashing of a 9 foot high drum resulting in an unchoreographed tumble off the platform. A few minutes later, three manic percussionists appear below the string players, adding a drumbeat of order and constraint at the bottom. There’s something vaguely Freudian about it: ego, id, superego. Hofesh appears throughout in different guises as a shouting dictator/lead singer figure, his intensity increasing as coherence decreases. 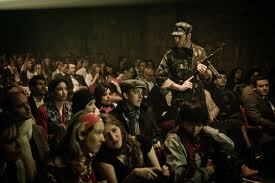 The dancers appear in tribes: colourful modern types, leathered soldiers, brown-clad underclass. There is a sense of building oppression – incoherent speeches are shouted into the crowd, peers fall under the spell of the dictator at differing rates, lovers fight and soothe in reaction to the stress of living in a politically straitjacketed state. Citizens try to enjoy lighter moments amidst the general fear and darkness; soldiers are as much under the cosh as anyone else. All of this is conveyed through moves that feel organic and realistic, based as they are on folk dance and familiar images of herd behaviour in crowds and rallies. Some moves seem reminiscent of club dancing; not surprising, I reflect, given that clubbing is after all a modern version of folk dance. In its group sequences, the company strikes a wonderful balance between looseness and tightness – you feel as if each dancer is breathing together but in their own way. Remembering the frustrations of my streetdance class earlier in the week, I have a fresh appreciation of what it takes to look that precise yet that casual. There are a few special touches at the end, like the company performing the main motifs of the show in reverse to the sound of Joni Mitchell singing ‘Both Sides Now’ almost as if to walk the audience gently back into real life. The dancers stay in character as they take their initial bows, easing only gradually back to their real selves. It’s a thrilling performance, and there is a largely thrilled, whooping audience – not least the groundlings who have been standing for an hour at the front of the stalls to add to the rock concert feel. To my mind, what could have increased its power still further would have been more of the kind of variation that happens at most good gigs – a bit more nuance, a few more ‘slow songs’ to counterpoint the fast and loud. If this piece seeks to conjure human experience in the face of extreme power, little moments of motherly tenderness might have taken a clearer place not just in the choreography but in the music, once the basic narrative of struggle had been established. And I did overhear the word ‘monotonous’ from a dissatisfied man on the way out. But as a heavy metal concert, I would say this was pretty unbeatable. I really wanted to come here. So much so that I got my lunching friend to change his reservation from High Timber to this new restaurant round the corner from the Barbican. My argument had been that High Timber had so much red meat on the menu that I’d be utterly compelled to have a matching glass of red wine. And that I am sleepily useless after a glass of wine at lunchtime unless I keep drinking steadily through the rest of the day (which typically results in a different type of day, and not one suited to conducting an effective video conference, say). 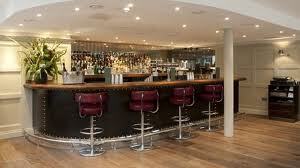 So, Chiswell Street Dining Rooms. My suggestion to meet here was driven by (a) curiosity at finding a new restaurant in a blank part of the London culinary map, just round the corner from the Barbican (b) a solidly positive review in Time Out the previous week. I’m happy to report that the lunchtime conversation was delightful, and that I was persuaded into a half glass of white wine without any dramatic consequences. The restaurant itself? Sigh. Well, I liked the colours (waxed dark wood lightened with sprightly lime-ish green) and the open feel of the place. As it steadily filled with impressive lunchtime traffic, the noise remained contained without being cold. We were able to discuss macroeconomics and theatre without bellowing. But I felt pretty flat about what filled this attractive space. The menu is the by-now familiar upscale modern British that you would recognise from a Hix. Seafood features strongly, with a selection of oysters, crab and sole. I had six terrifying langoustines that I had to approach sideways, unarmed by tools (well, I had four – I donated one to my friend to save my fingers from bleeding, and one fell apart as I dismantled it). I was having some difficulty navigating the main courses around the icebergs of my dietary restrictions, so then chose an unexpectedly uninspiring starter salad of quail’s eggs (of which two, halved), poached artichoke hearts (of which two, halved) and lots of frisée. Mustard aioli tasted neither of mustard or garlic overmuch. If you are unfettered by allergies, the menu is probably fine enough, though I noticed my friend was silent about his Berkswell cheese and leek tart, and left most of his richly dressed crab. It’s hardly the first time I’ve had challenges negotiating a menu, though. Normally, these days, waiters are kind and thorough in helping confused or constrained diners. So, here’s the thing. Our waiter was Not Good. He was very good at the following: rolling his eyes, pursing his lips, pinching his lower face so that it looked as if it had been swallowed by his neck. Vinegar-faced, sour-featured; all the hyphenated descriptions that unimaginative writers use for modestly ill-intentioned spinsters. He got friendlier towards the end of the meal, perhaps at the prospect of getting the table back, or perhaps because he caught me rolling my own eyes and thought me a kindred spirit. So, after a tentative enquiry after gluten-free bread drew a bemused shake of the head, I thought better of any further collaborative endeavour. Now, several people have written about good service at Chiswell Street, and a much smaller number have been disappointed. I’m guessing that on average the service is warmer than we received, since the general buzz about the place is in the major key. Given how often we go to the Barbican Centre, I might well go back to test the experience (or at least visit the slick bar) under a different set of circumstances. 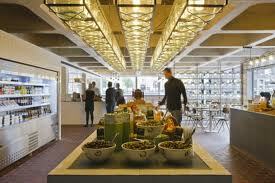 But the Barbican Foodhall has kicked up many, many notches in the past year, with its industrial cool décor, Severn & Wye smoked fish and Hope & Greenwood sweeties. If the suits ever discover it’s acceptable to put food on a tray, Chiswell Street will need do some quality control on its staff. 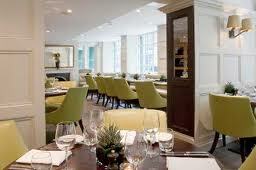 The Chiswell Street Dining Rooms are at 56 Chiswell Street, London EC1Y 4SA. When did you last design a theatre, hmm? Oh, “just last week” you say? You probably went to the Bush then, to see Where’s My Seat. Lucky you. Well, actually, in one of the two breaks, we did more than sip wine. We were sent on a tour of the building, from top to bottom, with 10 different stations where we got to answer questions such as: ‘what is theatre?’, ‘should the Bush do a musical?’, ‘reserved or unreserved seating?’ and the all-encompassing ‘what would you like the new Bush to be?’ Post-it notes, marker pens and coloured sticky dots helped people express their views. On the way, I wrote a bit of a play on a piece of paper hanging from the ceiling, and finished a bit of a crossword puzzle on the wall. Obviously, I loved this, as did everyone else. It’s well known in experimental psychology that giving people the chance to shape an outcome dramatically increases their attachment to it – people value a lottery ticket on which have chosen their own numbers around 5-10 times as much as one where they have been allocated the numbers. So this decision to involve the audience in shaping the future space of the Bush is extremely smart, as well as quirky. And as is typical of the Bush, the evening was not only smart and quirky, but enjoyably high quality. I won’t labour it since the run finished yesterday, but the three plays were all special in their own way: Deirdre Kinahan’s surreal ‘The Fingers of Faversham’; Jack Thorne’s poignant ‘Red Car, Blue Car’; Tom Wells’s surreal and poignant ‘Fossils’. The fluid cast of six actors was directed into their different formations by Tamara Hervey, and included truly big names such as Francesca Annis, Nina Sosanya and Hugo Speer. 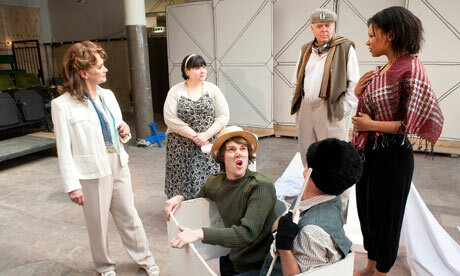 Each piece was built around nine bizarre props from the National Theatre’s dusty vaults (ranging from a large strawberry to a stuffed dog) and subject to challenging stage directions by Alan Ayckbourn, Michael Grandage and Bush Artistic Director Josie Rourke – giving the audience a sense of transparency in the artistic process. A neat parallel with the transparency of the process of building the physical environment. 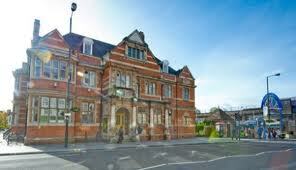 The place will open fully in the autumn, and it will go from strength to strength in its new home. But do go to see it in its current delightfully inchoate form if you can – and don’t forget to express your views on the bar snacks. When I was a kid, the height of scariness was getting into the Ghost Train at the funfair and being told to “keep your hands inside the car at all times for your own safety.” Then we would trundle forward into the gloom, through a dusty curtain, tightly packed into a painted crate with wheels. Spooky faces or bodies would swing out suddenly in front of us, against a backdrop of strange noises and the indifference of teenagers who had paid to snog each other in the dark. Well, that was the 1980s (or the 1970s, if you’re counting), and this is 30 years on. People are worldlier and more technologically sophisticated in what they demand for entertainment. So now – welcome to Free Run. This is the show based on free running, that form of functional acrobatics where athletic – and let’s be honest, mostly young – people aim to make their way across urban buildings and landscapes without being deflected by obstacles. They do this by jumping, rolling, swinging and flipping like psychedelic cats; there’s more trickery and swagger than the efficient French parkour from which it’s derived. Free running became popular in the UK after the documentary Jump London was released in 2003, and I remember how the small clutch of fanatics on the South Bank grew into big groups of aspiring teenagers in the following five years. It was faintly worrying watching them throw themselves from one concrete block to another, but compelling too. It got into mainstream consciousness sufficiently to merit a French and Saunders spoof in the Christmas special of 2006, but never lent itself to more than ad hoc performance in front of passers by – after all, by design, it happens in real-life outdoor locations. 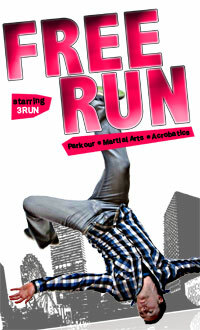 But in a bid to take it to the masses, a group of performers called 3Run has this year put together a show that can be staged indoors: et voila, Free Run. Billed as ‘spectacular entertainment for all ages’, a group of highly athletic and scantily dressed young men throw themselves enterprisingly around a minimal set: a few blocks, walls and pipes. The space is deliberately tuned to be dark and menacing. Portentous signs and announcements tell you to ‘sit tight, and don’t you dare leave your seat!’ Hand and arm movements are discouraged lest they get in the way of the scary leaping acrobats. Pounding music fills the space, strobe lighting flashes. Jagged video inserts give the guys time to catch their breath after their extraordinary feats. There is a long interlude where half a dozen of the performers put on a dystopian role play – three robot type baddies in robot type baddie outfits, chasing three innocent and creative escapees. trick mean that the audience was clapping slightly manically for 20 minutes straight). The stylised staging of the first two-thirds of the show by contrast felt a bit overworked, and slow in pace – the last thing I’m sure they wanted to convey. But it strikes me that I may not have been the intended audience. It had never occurred to me that this was for kids, perhaps because I’ve personally always enjoyed watching free runners and I’ve always seen it as something like an urban dance. But there’s no doubt that the ‘for all ages’ tag is a strong signal; despite the scary staging, the audience was packed with children looking for their very own Ghost Train experience. I noticed that there was a tiny boy, maybe 4 years old, sitting on the edge of his seat with his mouth open throughout the show. I saw he wasn’t the only one – although some were clearly terrified, the kids were mostly mesmerised. And as we sat in deckchairs outside the venue after the show, the Udderbelly was full of small bundles throwing themselves alarmingly around the ground, turning half cartwheels and wiggling their feet in the air. Probably a better outcome than the funfair ever achieved. 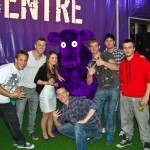 Free Run is on at the Udderbelly on the South Bank till 17 July, and then at the Edinburgh Fringe from 5-29 August. Before there was the blog, there were index cards. Instead of writing ‘previews’, we would write ourselves an index card for every cultural experience we wanted to try out, and then store it in a haphazard bundle in the kitchen until it worked its way to the top of the pile. A little low-tech as a process, but one that has seen us through a number of happily overstuffed weekends in London and elsewhere. Now, I admit that there had been a little card titled ‘Secret Cinema’ for over a year before we finally dressed up and headed out to explore this phenomenon. What made us wait so long? How hard is it to buy a ticket to a movie? 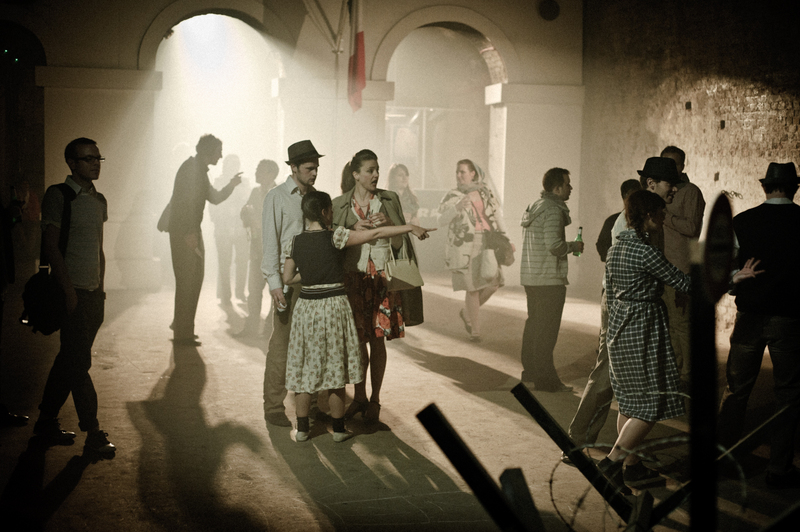 Well, as you probably know by now, Secret Cinema isn’t just a movie. It takes some planning to make it happen – admittedly more for the organisers than for the attendees, but still, there’s a little collaborative effort needed. And that’s the point, really. So, what do the organisers (Future Shorts) do? A couple of times a year, they single out a film that is rich in atmosphere, with a strong visual and cultural signature. They find a large and dormant building, then work for weeks to transform all its rooms and spaces into a theatrical set that echoes the film – including its food and architecture, its smells and sounds. They fill the place with 30, perhaps 50 or 100 actors who recreate the general backdrop of the film that is being shown. When you arrive, it’s impossible to know how many actors there are – because you’ve been given instructions ahead of time that ensure you are dressed just like the actors. At some point in the evening, you will sit down to watch the film, but before this you don’t know what you will be watching (unless you are able to decode the clues). You and the other 500 or so ticket holders wander around and absorb the sensory experience by interacting with the actors who play out small scenes from the film with and around you. If the film is Bladerunner, those experiences might include a woman trying to sell you a live scorpion in a jar. If it’s One Flew Over the Cuckoo’s Nest, you might be pressed into accepting therapy from Nurse Ratched. Because everyone is in costume and playing along, everyone can contribute at least in a small way to the immersive quality of the evening. Are these the good guys or the bad guys? Hard to tell. On the evening we went, during their April-May run, we extracted from our wardrobes our best approximation of stylish late 1950s clothes and joined a crowd pushing its way along Leake Street underneath Waterloo Station – the shivering dampness of the railway arches reminding me that there are little-known underground rivers that flow below the southern Thames flood plain. 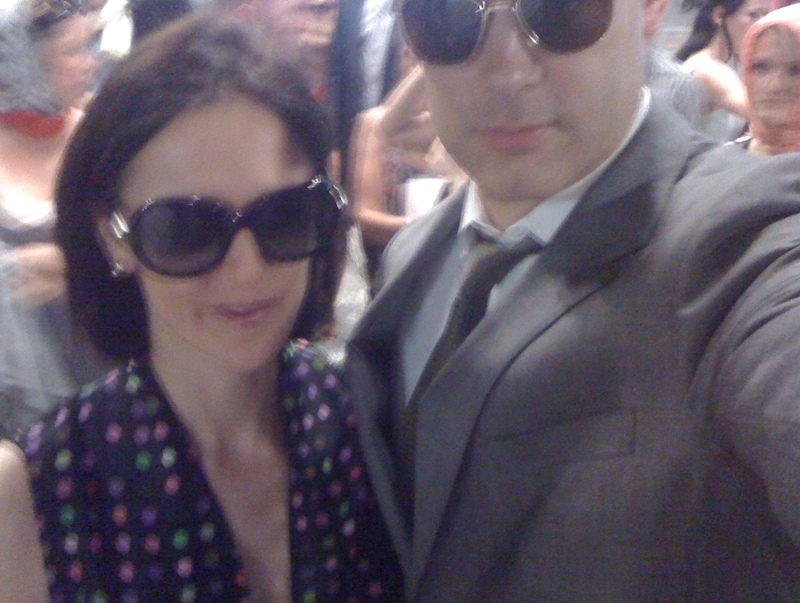 In the queue, we stood smugly untouched as French military police harangued and searched those less well-heeled people who had been instructed to follow a different dress code. Once inside, we ate lamb tagine and fended off a small girl who tried to sample our food, her mother rushing over to apologise for the intrusion. Soldiers stalked around barricades set close to an ancient Air France office; we drank rough red wine from the Milk Bar. All around were north African buildings, tea shops and women in white niqabs – one of whom invited us to follow her and to be privileged guests at a discreet wedding in a lace-decorated courtyard. We watched the ceremony from a balcony, then scattered quickly as ululations were hushed and the wedding party disbanded. There was everywhere a sense of suppressed tension. Or indeed, open tension, when we discovered the barbed wire prison holding pens, complete with prisoners. Deep though the immersion was, we weren’t equal to the task of trying to guess which film we were experiencing. Everyone was speaking French and Arabic, but the tone was too dark to be Casablanca. After a couple of hours of walking, talking, watching and drinking, we filed into the old-fashioned cinema at the centre of the set. Once full, three soldiers strode to the front and asked for us to be patient with the security measures and announced that we would “triumph over terror”. No translations were offered for those who spoke no French, adding to the mood of curiosity and vague confusion in the audience. And then a ripple of surprise as the opening credits rolled to reveal that we would be watching ‘The Battle of Algiers’. No blockbuster, then, but an art film. And really, w e were wrong again. The Battle of Algiers is less an art film, more a stunning docu-drama: Gillo Pontecorvo’s uncompromising exposition of the struggle between colonial France and independence-minded Algeria. Released in 1966, just a couple of years after the events it depicts, it controversially explored the perspective of the terrorists and cast non-professional actors recruited from the streets of Algiers to heighten the sense of realism. Described by Edward Said as “one of the two greatest political films ever made” and by the founder of Secret Cinema as “one of the most truthful and significant films ever made about conflict”, it was reportedly screened at the Pentagon in 2003 to demonstrate ‘how to win a battle against terrorism and lose the war of ideas’. You might have expected most of the audience to flag before its black-and-white subtitled onslaught. But its contemporary relevance and narrative power was obvious enough to the audience that more than two-thirds stayed glued to their seats throughout. We found it gripping. On reflection, I think you can experience Secret Cinema on one of two levels. One is of course to enjoy the amusement of participating rather than merely spectating, of dressing up and imbibing a little of the creativity of others. That was what I had expected, and that was certainly part of the deal. What I had not expected was the next layer of experience. By tuning into the fabric and characters of the film beforehand, you care far more about the little girl, the bridegroom, the soldier and the terrorist you see on screen. You notice far more detail; you are more willing and more able to see all sides. When the Milk Bar that served you your drinks is bombed in the film, your shock is deeper, your reaction more complicated. You are inescapably vested in the emotional currents of the movie. 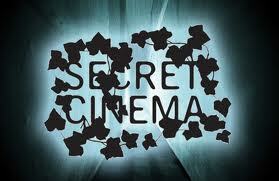 As Kevin Spacey says, “Secret Cinema has created a new way of experiencing film. The fusion of film and theatre allows for a much more powerful experience and adds an incredibly unique dimension for the audience. It certainly did for me. I was blown away”. I don’t know how far that happens with less startling films. After all, however excited people can get about arguing that the original pales next to the director’s cut of Bladerunner, it’s never actually been banned or used to change the course of a war. But they do have a habit of choosing meaty films (including Paranoid Park and The Red Shoes, for example) and we found it such an enriching way of seeing a film that we will eagerly sign up for future productions. Not that we have any idea what, where or when they will be – but we’ll find out.